Recently, I’ve read and heard a lot of quibbling between libertarians of various circles on the legitimacy of the Dakota Access Pipeline. Hearing political pundits, and libertarian purists from one side or the other discuss this issue has been intriguing to me. As a libertarian, there are elements of this issue that I think many commentators are neglecting. I want to straighten out some misleading facts being introduced to this debate. The Dakota Access Pipeline (or DAPL) is an underground pipeline that is set to span over four states, North Dakota, South Dakota, Iowa, and Illinois. It is approximately 1,172 mile, 30-inch diameter pipeline that will connect the rapidly expanding Bakken and Three Forks production areas in northwestern North Dakota, to Patoka, Illinois. It will transport approximately 470,000 barrels of oil per day with a capacity as high as 570,000 according to Dakota Access, LLC. It will cost them about $3.78 billion to complete. Dakota Access Pipeline was originally set to go just north of the North Dakota capitol of Bismarck, and burrow beneath of the Missouri River at this point. After Dakota Access, LLC provided the required environmental impact statement to the residents of Bismarck, the pipeline was rejected. Dakota Access then rerouted this pipeline, to what they consider to be a ‘low impact area’ – this area is just north of the community, literally 1,500 feet of Cannonball, ND which is located on the Standing Rock Sioux Reservation. 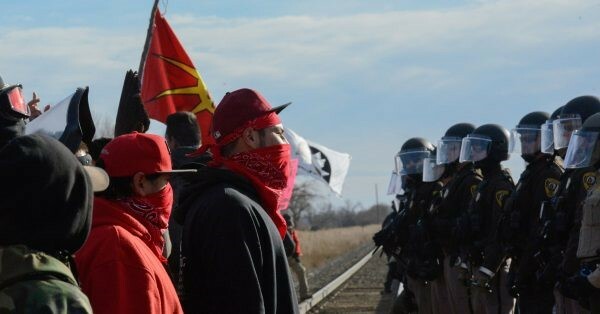 Since April, three camps have been opposing the pipeline on its frontline, by means of non-violent resistance. Rosebud (Sicanju) Camp, on the reservation, and across the river is Sacred Stone Camp, and Oceti Sakowin Camp, which is the largest, which is on land presently controlled by the Army Corps of Engineers. The Standing Rock Sioux Tribe in 2014 were informed of the proposed route. They objected to this proposed route, seeking to block permits until the tribe could meet with developers to discuss historically important sites, as well as cultural and ceremonial sites with evidence of human remains. These requested meetings were ignored. Stated reasons to oppose this project seem to be environmental concerns, raised by the pipeline running beneath the Missouri River, and cultural concerns. What many of us libertarians fail to grasp, is that there are some serious property rights concerns here as well, some have been left unresolved for 165 years. 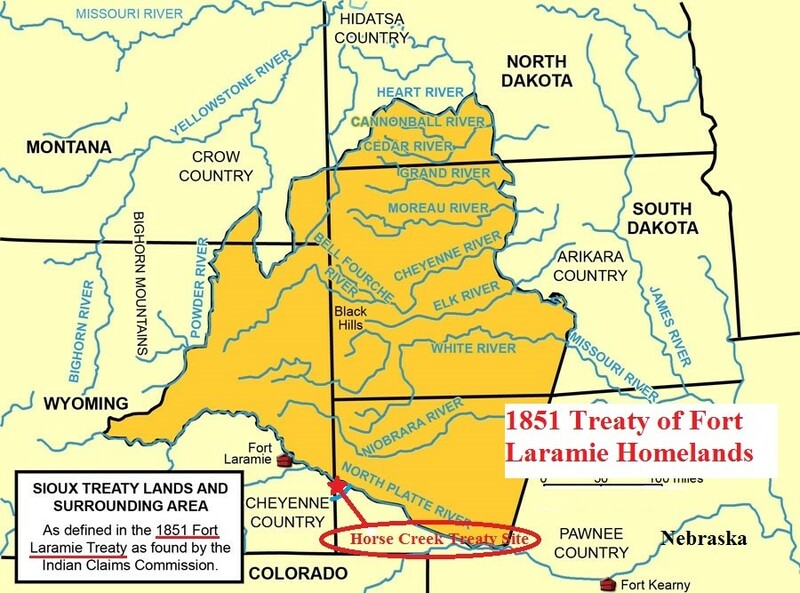 In September of 1851 the United States treaty commissioners and representatives of the Sioux, Cheyenne, Arapahoe, Crow, Assiniboine, Mandan, Hidatsa, and Arikara Nations met at Horse Creek, and came to an agreement. In this treaty, the United States government acknowledged that all land covered within this treaty was Indian territory, and did not claim nor lay stake to any part of it. The treaty was designed to grant safe passage to settlers passing through this territory on the Oregon Trail and allowed roads and forts to be built in their territories in return for promises of an annuity in the amount of fifty thousand dollars for fifty years. The treaty was to also “make an effective and lasting peace” among the eight tribes, each of them often at odds with some of the others. The treaty did result in a very short period of peace, but it was broken by the United States government when it failed to prevent the mass emigration of miners flooding Colorado during the Pike’s Peak Gold Rush. The settlers took over Indian lands acknowledged as such by the United States, in order to mine them. Because of this influx in settlers encroaching on Indian land, and the settlers’ fear of defensive attacks by the tribes who inhabited and owned the land, military patrols were set up throughout the region, from the various forts that were built under the Treaty agreement. In 1854, a Lakota man was accused of allegedly stealing a cow, a detachment of US soldiers broke treaty regulations, and entered the encampment to arrest him. In the process they killed Conquering Bear, the Lakota chief of this encampment. After this treaty, wars ensued, other treaties were made, which were swiftly broken. In 1868, the United States entered into another treaty with the Sioux to end Red Cloud’s War, which was seen as a Sioux uprising against the US government, because it was. The treaty was amended in-route to Washington, DC, omitting property previously acknowledged by the US government, which lead to the Plains Indian Wars, or the Great Sioux Wars, which ended at the battle of the Little Bighorn (Greasy Grass) where General George Armstrong Custer and the entire 7th Calvary was defeated in June, 1876. It’s the only time in history the US Calvary was defeated on the field of battle. 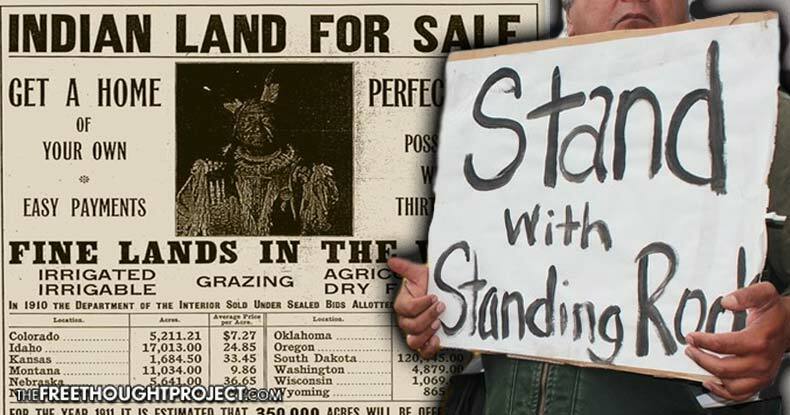 In 1980 the United States Supreme Court ruled that lands were illegally taken from the Sioux Nation in the 1868 Treaty. They awarded the Sioux $15.5 million for the market value of the land including and around the Black Hills in South Dakota in 1877, along with 103 years of interest at 5%, for an additional $105 million. 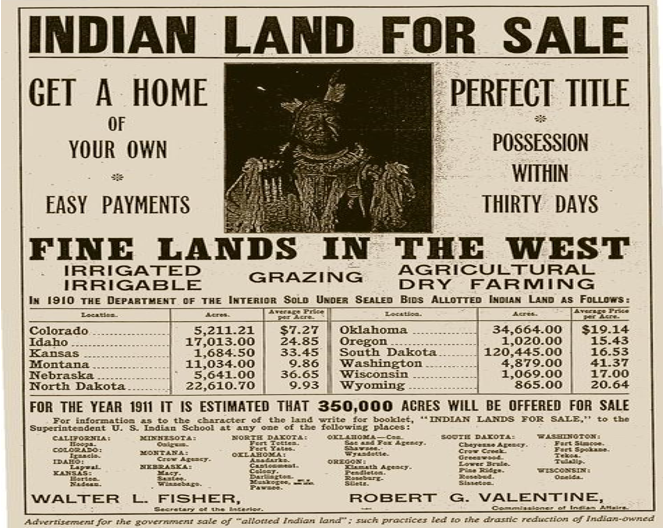 The Sioux Nation rejected this payout, demanding their lands be returned to them. The payout is sitting in a Treasury account, worth over $1 billion. This court case did not resolve the land claim issues surrounding the Treaty of 1851. The land in question near the Standing Rock Sioux tribal boundary where this proposed pipeline is tunneling through, was initially acknowledged and understood by the United States government to be Sioux land, under the control of sovereign people. But, I know what you’re thinking – that’s 165 years ago! All of the people who were around back then are dead and gone, and if the government gives all that land back to the Indians, a lot of property rights of people will be violated! Of course, it’s unrealistic to expect this. As much as I want the US government to acknowledge Native property stakes, that they have historically acknowledged, and honor these treaties – I know in my heart, it probably isn’t going to happen. This doesn’t make Indigenous property claims any less legitimate. According to the US Constitution, Article II Section 2, treaties are standing and superior law. In private property ethic, we understand that if a theft has taken place, and the stolen property is sold to an unwitting buyer, this is a fraud. The sale is null-and-void. Of course, this leaves some room for speculation, but I’m pretty sure all of the buyers of the lands in questions knew it was Indian land. I would think any principled propertarian should understand that knowingly purchasing stolen property is also a crime. Okay, so we’ve gotten through 1876, and to avoid a play by play of the dry, depressing history, we all know pretty much what happened thereafter. In 1889 reservation boundaries redefined, in 1910 reorganized (more land taken) into what we have today (more or less), Indians go to the prison camp (reservation) or die, enter missionaries, boarding schools, welfare rations, etc. In 1924 Native people were given citizenship, etc. Now we’re to 1944. In 1944 something called the “New Deal” was all the new rage to get Americans out of an economic depression, in the early to late 1930s. I’ll spare you the history, because we all know it – we’re libertarians, after all, right? Within the New Deal-era reforms and legislations, something called the Pick-Sloan Flood Control Act of 1944 was born. This granted the US government power over the Missouri River basin, to build dams, and flood areas it seized by eminent domain. The Cheyenne River Sioux Reservation, and the Standing Rock Sioux Reservation border this river. According to the 1851 treaty, they understood the river to be theirs, to the eastern bank, including the river bed. The US Army Corps of Engineers came in in 1952, tribal citizens were forced from their homes in the bottomlands—the forested, naturally flooded habitat to a wide variety of plants and animals. The new dams created reservoirs, but no plans for those who were displaced by them, and nearly no fair compensation. According to some estimates, the United States flooded 90% of the timber resources of the Sioux Nation. Medicine and food plants that had always sustained Sioux lifestyle were submerged, and loss of access to water and fishing devastated remaining traditions. The remaining reservation lands were primarily the less fertile prairies. The Pick-Sloan Plan has been said to be, without doubt, the single most destructive act ever perpetrated on Indigenous people, their natural resources and property rights by the United States government in the modern era. The government’s continued mismanagement of infrastructure, especially on Indian land has lead to some of the most devastating occurrences. In 2000 the Standing Rock Sioux Tribe joined other tribes in filing suit against the US government when mismanagement of water levels lead to burial sites being exposed. 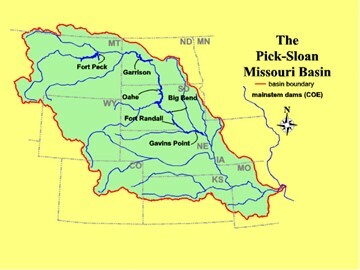 Without the New Deal, and Pick-Sloan, the US Army Corps would not hold the land in question that the Dakota Access Pipeline needs to proceed under the Missouri River. This is the permit the Obama administration currently has put on hold until February 2017. The Dakota Access Pipeline has not used eminent domain in North Dakota, and many proponents of this pipeline will be quick to tell you that. 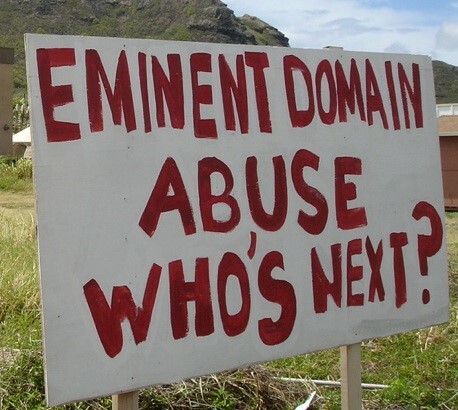 What they will not tell you, which is a purposeful omission, is that eminent domain has been used in Iowa. Farmers sued the Iowa Utilities Board in an effort to prevent the company from gaining the right to use the government as a property-seizing mechanism. The judge ruled against them. Framers began suing the pipeline developers in May of 2016, a month after the original opposition camp in North Dakota was established, in an effort to prevent the use of eminent domain to seize private property for the benefit of the pipeline owners. There are nearly 2,000 properties along the route through Iowa. As of November, owners of over a dozen parcels have sued over the fact that the State of Iowa has handed over 200 pieces of land under eminent domain laws. Despite my very real feelings about treaties, and the past crimes of this criminal government against the original inhabitants of this country, this key factor should be enough to convince any libertarian that this pipeline should be rejected. As I mentioned previously, this pipeline was supposed to be placed north of Bismarck, which would be outside the 1851 boundary. The residents of Bismarck rejected the construction citing environmental concerns. Oddly, the community of Cannonball and the Standing Rock Sioux Tribe weren’t given such a chance to object. They were never provided with an environmental impact statement, which is required under present US law. You won’t find an argument from me on this law, or the EPA. I’m a libertarian, I think they’re the most detrimental to the environment and that these laws are unnecessary with real and definable property rights. But since I’ve established that in the case of Indian folks not all property owners are equal in this country — let’s ask why? Why were Bismarck area residents given an environmental impact statement and able to object and have it moved, but Sioux residents 1,500 feet from the construction not given the same statement or opportunity? They’ve been opposing this pipeline since 2014. One hundred and sixty-five years of broken promises, murder, military campaigns, biological warfare, economic warfare, forced removal, prison camps, being wards of the State, the people of Standing Rock, and many from throughout Indigenous America, have had enough. They started a camp on their traditional land — land that their ancestors fought and died for, and their grandparents were pushed off of in the 1950s by the Army Corps of Engineers. Land that people have relatives, fathers, and sons buried on. They aren’t going to let this go through quietly. They want to protect the resources that are rightfully theirs, their land, their river, their water. The Oceti Sakowin (Sioux Nation) is staring in the face of the monster that has been on their land for centuries, which their ancestors saw in the eyes of the United States military when they defended the railroad workers and contracted buffalo slaughterers ripping across their land. This is so much more than ancient history. For many, it is the chance to fight what their grandparents and great-grandparents told them stories about, but were powerless against. This indeed may be the final chance to change the history of betrayal and violation of Indigenous rights. Our only hope to continue our struggle to real sovereignty, economic independence, and renewable energy infrastructure is today – and it’s when this pipeline is stopped.